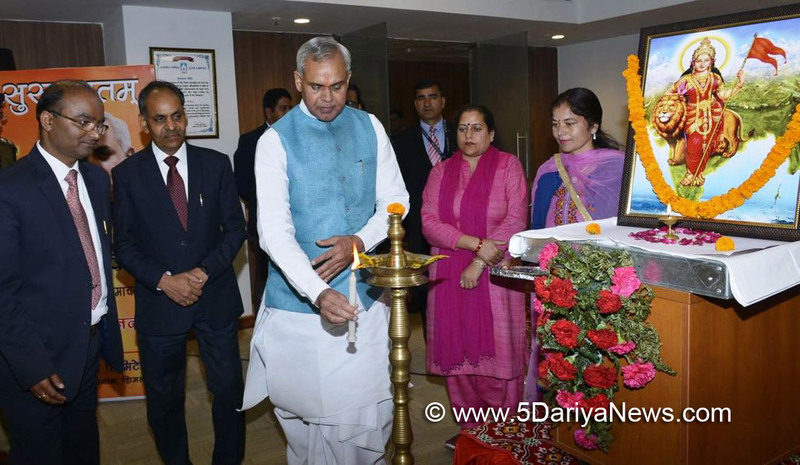 Governor Acharya Devvrat said that we should take pride on our rich culture and traditions. He said that we should follow our rich ethos by adapting Indian values then only we can take the country on the path of progress.Governor was speaking as Chief Guest in the Indian New Year programme organized at Sutlej Jal Vidyut Nigam Limited (SJVNL) headquarters Shakti Bhawan, Shanan near Shimla.Congratulating SJVNL for organizing Indian New Year programme, Governor said that SJVNL had contributed a lot in the nation's progress and development. It has been organizing programmes on promoting culture and social services.He urged youth to inculcate Indian moral values instead of following western culture. He said that Britishers had ruled the country for a very long period and they destroyed our rich culture so that we feel low about our values. We should not only proud of our traditions, culture, language, costumes but make these our part of our life.Governor appealed to the people for taking pledge on the occasion of Indian New Year to work for nation building, drug eradication and adapting Hindi language.He also planted a sapling on the occasion.Earlier, Chairman and Managing Director, SJVNL Nand Lal Sharma welcomed the Governor and said that SJVNL would work on various social initiatives started by the Governor in the state.Famous writer Dr. Om Prakash Saraswat gave detail about ancient Indian time theory.General Manager SJVNL Salil Samsheri presented vote of thanks.